The debate about wind farms generates a lot of heat but little light. We have seen proposals to provide limited compensation to affected communities but why do industry experts often deny the occurrence of excess amplitude modulation (EAM)? Are they zealots, protecting their interests, or genuinely unaware of it? 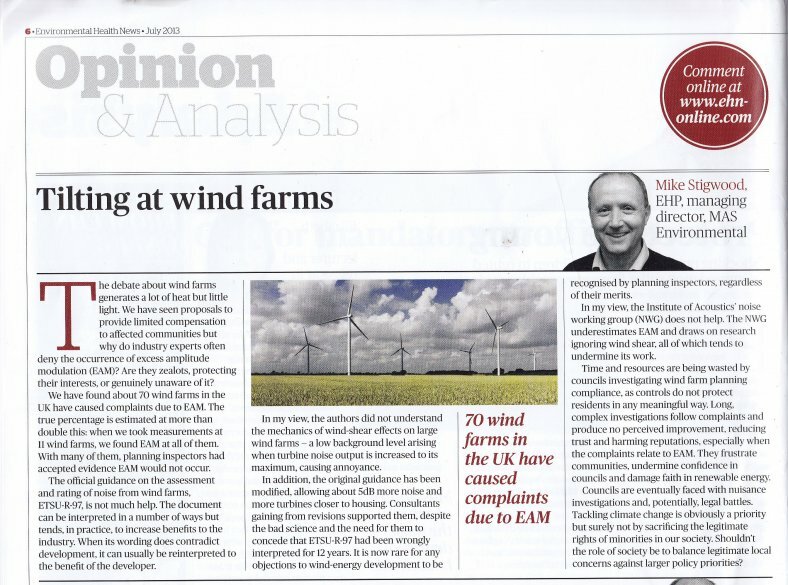 We have found about 70 wind farms in the UK have caused complaints due to EAM. The true percentage is estimated at more than double this: when we took measurements at 11 wind farms, we found EAM at all of them. With many of them, planning inspectors had accepted evidence EAM would not occur. The official guidance on the assessment and rating of noise from wind farms, ETSU-R-97, is not much help. The document can be interpreted in a number of ways but tends, in practice, to increase benefits to the industry. When its wording does contradict development, it can usually be reinterpreted to the benefit of the developer. In my view, the authors did not understand the mechanics of wind-shear effects on large wind farms — a low background level arising when turbine noise output is increased to its maximum, causing annoyance. In addition, the original guidance has been modified, allowing about 5dB more noise and more turbines closer to housing. Consultants gaining from revisions supported them, despite the bad science and the need for them to concede that ETSU-R-97 had been wrongly interpreted for 12 years. It is now rare for any objections to wind-energy development to be recognised by planning inspectors, regardless of their merits. In my view, the Institute of Acoustics' noise working group (NWG) does not help. The NWG underestimates EAM and draws on research ignoring wind shear, all of which tends to undermine its work. Time and resources are being wasted by councils investigating wind farm planning compliance, as controls do not protect residents in any meaningful way. Long, complex investigations follow complaints and produce no perceived improvement, reducing trust and harming reputations, especially when the complaints relate to EAM. They frustrate communities, undermine confidence in councils and damage faith in renewable energy. Councils are eventually faced with nuisance investigations and, potentially, legal battles. Tackling climate change is obviously a priority but surely not by sacrificing the legitimate rights of minorities in our society. Shouldn't the role of society be to balance legitimate local concerns against larger policy priorities?